The implications for national governments seeking to regulate capitalism in the public interest are obvious. The economist Max Otte has called ISDS ‘a complete disempowerment of politics’. The tribunals are confidential, as is usual in arbitration. Negotiations over ISDS within TTIP are also secret, the aim being to get the ink dry on the agreement before it can provoke opposition by being made public. 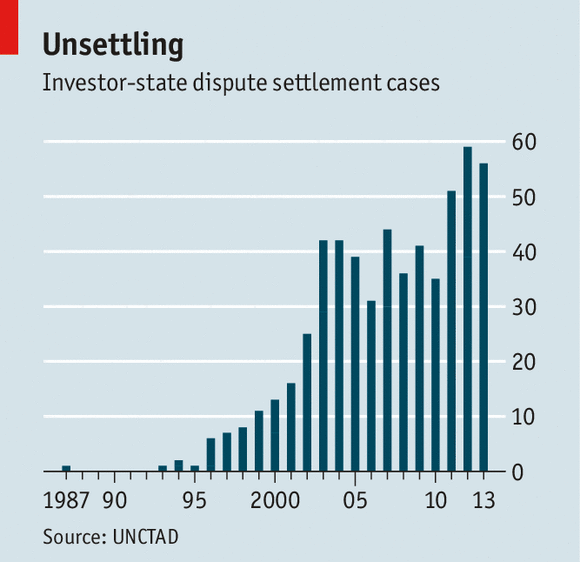 Bilateral ISDS treaties have been around since the late 1950s, but ISDS litigation has rocketed in the last twenty years. Cases are now being filed at the rate of one a week. In January, an ISDS tribunal in The Hague overruled the Ecuadorian Supreme Court, which in 2013 confirmed the judgment of a lower Ecuadorian court that the oil firm Chevron would have to pay out $9.5 billion in damages for polluting the environment in the Oriente region. Texaco, acquired by Chevron in 2001, began drilling in the Ecuadorian Amazon in 1964. Billions of litres of wastewater were dumped in the rivers, contaminating food sources and exposing inhabitants to carcinogenic toxins responsible, inter alia, for elevated child leukaemia rates. Indigenous Ecuadorians say that oil workers dynamited their homes and subjected them to sexual and other violence. Chevron says it ‘is defending itself against false allegations that it is responsible for alleged environmental and social harms’. Ecuador has already been whacked by ISDS litigation initiated by petrol firms. In 2012 it was fined $1.8 billion plus interest – more than its annual healthcare budget – after it cancelled a joint exploration venture with the oil giant Occidental. Meanwhile, the Australian mining firm OceanaGold is suing El Salvador for withholding gold extraction permits from its subsidiary Pac Rim Cayman LLC – a result of government concerns that cyanide, used in early mining to extract gold from its ore, had polluted water supplies. OceanaGold is after $284 million, more than El Salvador's annual foreign aid income. On 19 April, the human rights lawyer Alfred de Zayas told the Council of Europe that 'the proposed TTIP investment court system is but a zombie of ISDS'. Chevron has lobbied Brussels to beef up the ISDS element of TTIP; the firm has prospected for shale gas in Romania and Poland. In 2012 the Swedish nuclear firm Vattenfall sued Germany over its decommissioning of nuclear plant after Fukushima, for a reported $4 billion. Vattenfall and other ISDS litigants allege 'expropriation', a cloudy notion, put out to consultation ahead of talks over ISDS at TTIP. Direct expropriation covers such policies as nationalisation without compensation; indirect expropriation includes, in principle, whatever might degrade an investment's value, such as laws enforcing workers' rights, environmental protection, product safety, healthcare standards and so on. 'Property' lost by expropriation may stretch to anticipated revenue streams and knock-on effects on asset values. It is regretful that this article repeats a number of popular but inaccurate tropes about investor-state disputes. Firstly, it is highly misleading to describe bilateral investment treaties as giving "firms the right to raise an action in a tribunal on the basis that a state’s policies have harmed their commercial interests". That suggests that a treaty grants commercial immunity to firms against state actions, which is far from the truth. The reality is that bilateral investment treaties serve two main functions. The first is to ensure that foreign firms are treated on a level playing field with local firms. The second is to provide for a forum to decide disputes that is not susceptible to governmental interference. In many cases, a claim under a bilateral investment treaty will be one that could have been brought in a local court, but where the investor has no confidence that it would receive a fair hearing. Secondly, bilateral investment treaties do not grant rights across the board to companies operating in a country. The clue is in the name. The treaties are bilateral - so there must be a treaty between the two countries before an investor from one country can claim protection in another. And they are limited to protecting investments - which, in international law, does not extend to speculative or even simple trading activities. Thirdly, these treaties are entered into between sovereign nations; they are not imposed. Negotiations may be conducted in secret - most diplomacy is - but a treaty will need to be ratified according to a country's laws before it takes effect. Countries enter into them because they believe the advantages will outweigh the costs. Equally, a country is free to withdraw from a treaty if it changes its mind. Finally, treaty arbitration is not usually confidential. The two main bodies used to conduct treaty arbitration - ICSID, which is part of the World Bank, and UNCITRAL, which is run by the UN - publish their decisions. Which makes it all the more of a shame that so few journalists bother to read them. Sincerest apologies if it isn't. If it is, one can't help observing that you guys are going to make out like bandits if this treaty goes through. "The first is to ensure that foreign firms are treated on a level playing field with local firms." Blake's words quoted in these pages two decades ago by LRB's own Stephen Sedley still ring in the ear, "‘One law for the Lion & Ox is oppression.'" And so it is in a Bolivia where American mining conglomerates compete on a "level" playing field with local miners. Well, I guess they make out like bandits whatever. For a change I agree with some of what Glenn Newey says but it is also useful to read JonathanDawid's angle too. I would find this kind of special pleading on behalf of corporate interests slightly more convincing if the process was being pursued in a manner which made it open to scrutiny and informed democratic debate by the citizens who's lives this is going to effect, rather than just a cabal of special interests. The standard modus operandi by the powerful seems to be to claim spurious legitimacy because nobody complained in a timely manner, simply because they were excluded from having any access to any real information or the resources required to legally scrutinise such deals until it all becomes a fait accompli. "Firstly, it is highly misleading to describe bilateral investment treaties as giving “firms the right to raise an action in a tribunal on the basis that a state’s policies have harmed their commercial interests”." By your own admission, the treaties provide forums for such actions to be raised. The article gives examples of such actions being raised in such forums, and the resulting damages awarded to the corporations. Nothing here, implied or otherwise, about commercial immunity. It is to be regretted that you can't see that. The second is to provide for a forum to decide disputes that is not susceptible to governmental interference. I fear that this really means, not susceptible to local democratic will. "a country is free to withdraw from a treaty if it changes its mind." Maybe you should try and think politically. Who wants these treaties? Are they popular? No. (So obvious NO referendum!) They are elite projects pushing corporate power at the expense of any pretense to democracy. That might be fine with you, but the real shame here is you seem to think that that is all there is to it. One is aghast at a respected self-promoting and gown-toting lawyer coming forward with such anodyne assurances as to the legal impartiality of TTIP. Brick Court Chambers so aptly named as a bastion of legal protection needs more light let in. As has been said in comment - 'think political' is the appropriate stance with which to begin. How can it be that a Global Investor carrying vast wealth can ever settle for a level playing field? Such an entity will inevitably buy what ever entrance it may desire to secure contracts and privileges - the Law in these cases if ratified without proper and wide scrutiny of the vested interests will be framed to that need. That is what we are looking at. If Trump trumps in November and 'America First' is the call we may just as well cash-out now and declare no hand. Barak Obama could not secure fairness in his two terms of office for the struggling echelons of American people so why should we open the back door to any future US administration that will support a Moloch of crushing greed and unconcern? We can have investment on much better terms, if only Brick Court and the like would give their minds to it. You say you're aghast. Is that in the same way that Captain Renault was 'shocked, shocked to find that gambling is going on in here'? Unfortunately, the most abiding legacy of this President will be the TTIP, TPP, TISA, the Korea trade deal and Obamacare: all presents to his corporate donors. His reward, upon leaving office, will be multi-million pay offs for delivering on his promises. Lord only knows what promises his likely successor has made to corporate America, but since they've been paid for they too will be delivered upon - with the enthusiastic support of a Republican Congress. In answer to Joe's allusion to Captain Louis Renault and my celluloid vocabulary I can only say that 'aghast' philosophically it is an integral part of my Enhanced Indispensibility argument grounded upon a Platonic presumption that the mathematical calculations supporting TTIP cannot be defended as legal propositions for they are in essence corrupt by virtue of their partiality toward one side of the equation; therefore Capt Renault although coming up trumps in the denouement cannot be allowed to stand between me and my vocabulary. Of course Rick was a supporter of the loyalist side in the Spanish Civil war so that muddies the water. Perhaps TTIP should not be so labelled but TTFN might be more appropriate - Tata for now. Stunts such as TTIP never mention liberalizing the residence and employment rules so that people on either side could live and work wherever they choose. This shows the deal is not meant to benefit the riffraff.